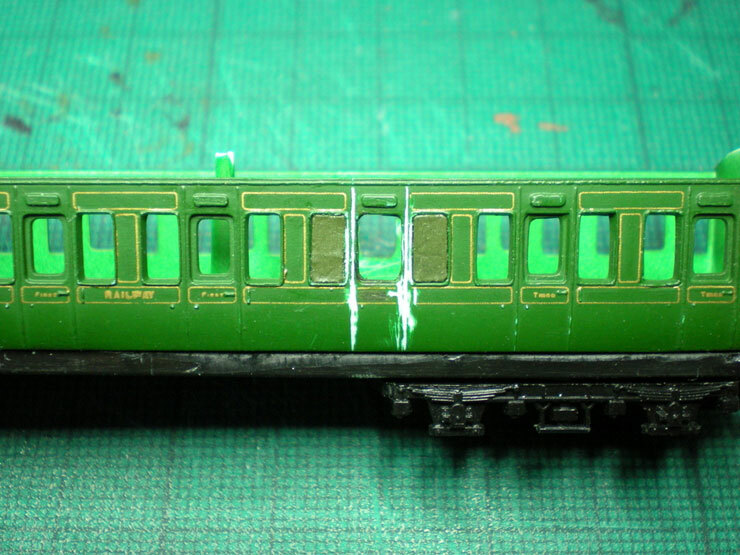 It's time to do some upgrade work on the Poole-era Graham Farish suburban carriages to make them more LSWR-like (albeit in SR livery and lettering). Fortunately there are quite a few modelling aids for doing this sort of work, although it seems strange that no one seems to have tried it before. At least, there seems to be nothing online to say so. 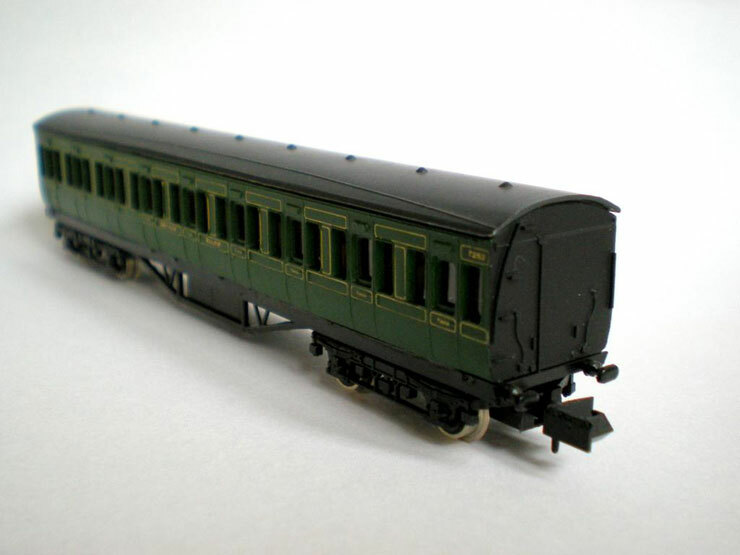 There are a lot of problems with accuracy in the Poole-era coaches (especially given the fact that they are closer to LMS suburban carriages in their details than they are to any LSWR carriages), but they'll do until someone produces a decent range of bogie carriage LSWR kits. So these are the victims... I mean volunteers. At a little over 57ft they'll do for matching up fairly closely to LSWR 56ft units of 1904-1910. So what's needed to do all of that? Fix the roof using plasticard? What thickness? Wire for rainstrips? Roof vents = Ultima LNWR/BR Ridged Dome Vent (Pack of 25) UM256? 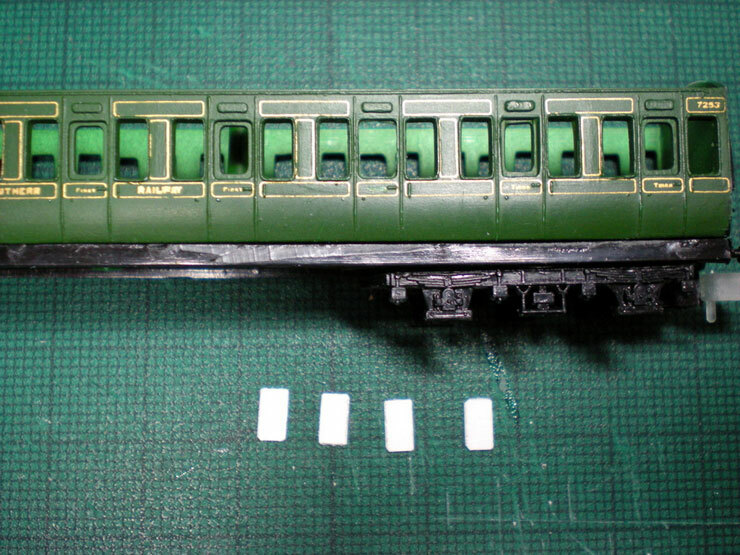 Carriage ends = plasticard shaped to permit the LSWR roof profile? 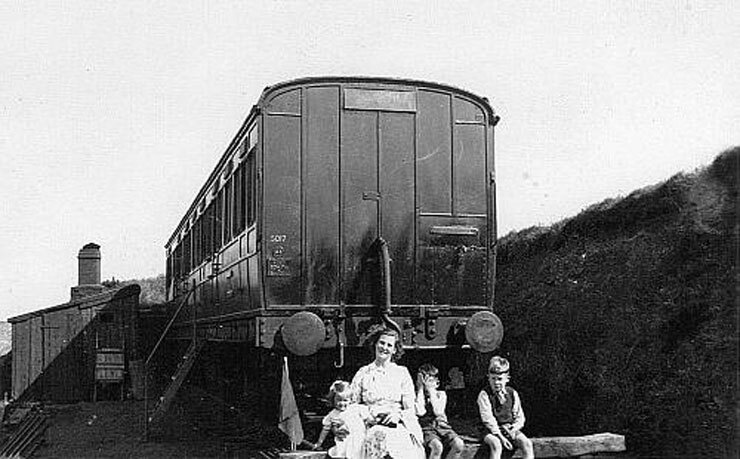 Thin wire glued vertically to create that panelled appearance so typical of pre-Grouping carriages? Thicker wire for pipes, grab rails on roof, and curved handrails? Guard's lookout ducket = Ultima LSWR Etched Duckets (4 Pack) LSW97? Add closer coupling = cut down one coupling to reduce length and glue back into position? Remove dynamos/battery boxes = drill out and file, or remove entire section and replace with wire? Renumber each unit = SR carriage side numbers? I'm happy to make believe that these carriages are 56 footers so that I don't have to chop off bits (which would mean buying the appropriate cutting instruments). These two coaches will form a permanent two-car set. The set numbers can be bought from Fox, but I haven't located individual SR coach running numbers yet. To my mind, the roof profile is one of the most important things to change, along with adding the torpedo vents. 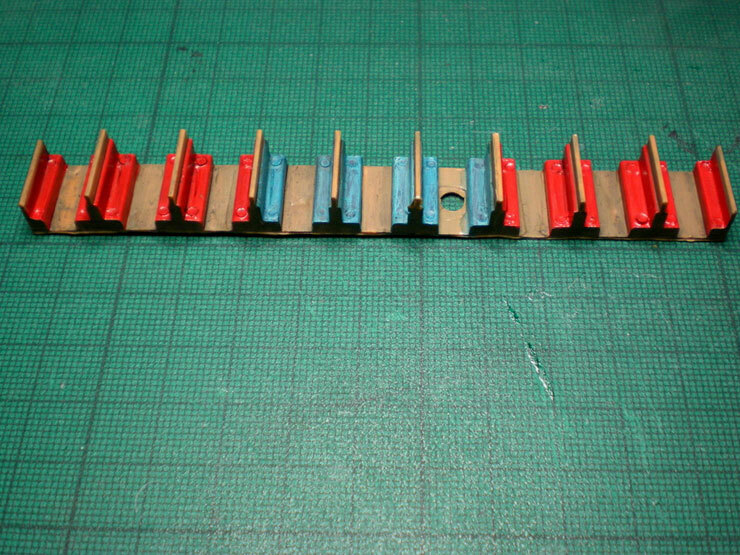 After all, it's the roof that will be seen most often when the carriages are on the layout. There seem to be two viable options for the roof - contact Etched Pixels or use card because it will be much easier to shape than plasticard. The existing shape is too flat at the corners though. 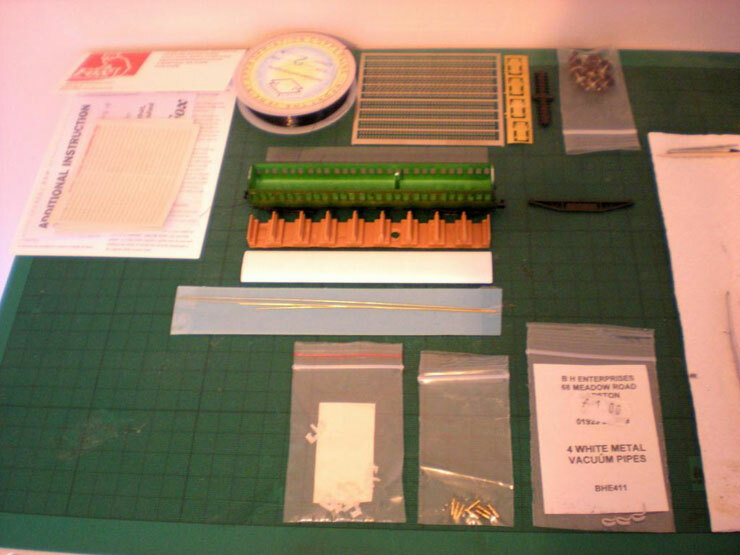 That weird LSWR roof shape demands a much squarer corner, so card will probably be the way to go. Once the vertical strips, pipes, steps, grab rails, rooftop handles, and vacuum pipes are added it should look pretty good. The lower bar needs to be snipped off each bogie. 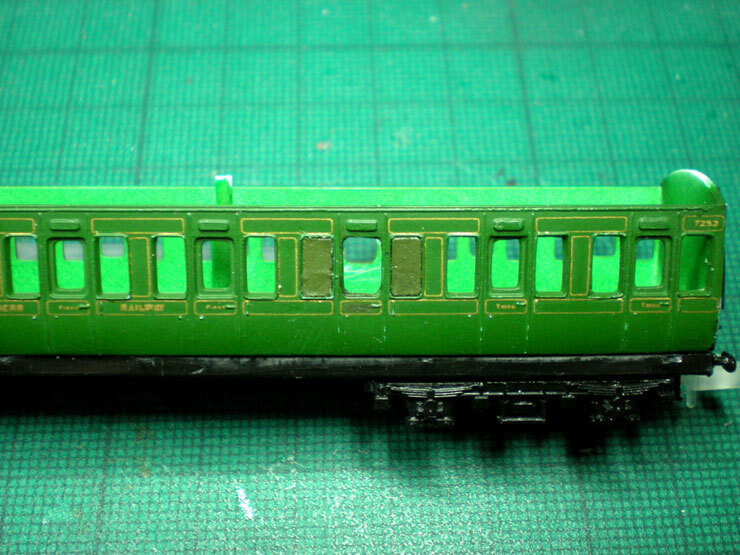 I have no plans to swap out the actual bogies, but this is another minor change that will help to make them look less like generic Poole-era plastic coaches and more like the representative (in the broadest sense) coaches that I'm aiming for. They'll never be perfect (the doors and windows are marginally inaccurate for a start), but they will look right to the average viewer, and they'll look very much upgraded and amended as much as possible, which is what's important. 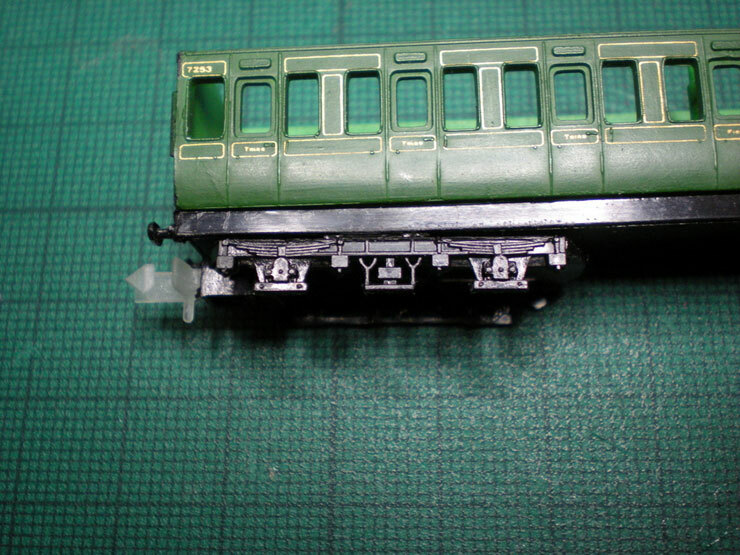 The battery boxes on some coaches in each set need to be removed, too. 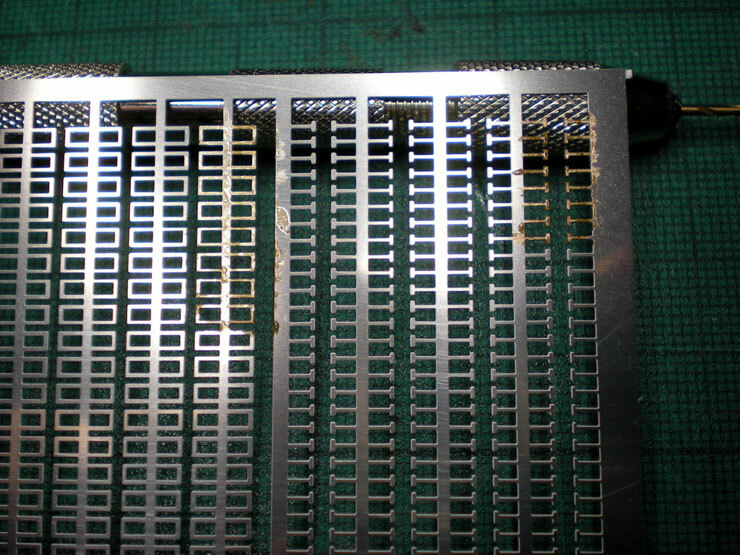 I'm wondering if drilling and filing is the best way to do this. I think the roofs will be the most important, and most noticeable change, but the rest will certainly help. 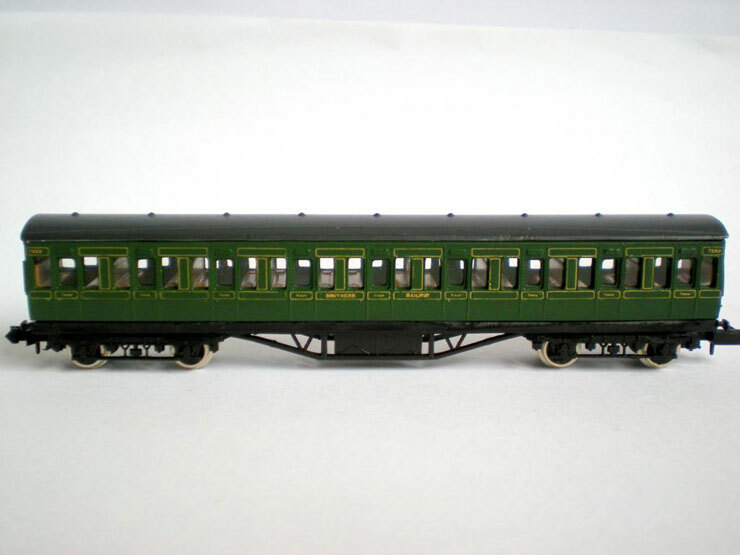 As for the seating, the Southern Railway seems to use dark red for second class seating and blue/grey in first class. Believe it or not, it has taken since July to pull all of the pieces together for this project, and now I'm too busy with work and preparing an imminent publication on the History Files to be able to get started until after Christmas. Oh well, at least I can go over all the parts. Many of these were the result of recommendations from the NGF, so thanks are due here to everyone who helped. Plus I need to source some plasticard or good quality card for the end panels, end panel steps, and also a strip along the top of the chassis to provide the missing running board on each side. We're just about ready to go... possibly. 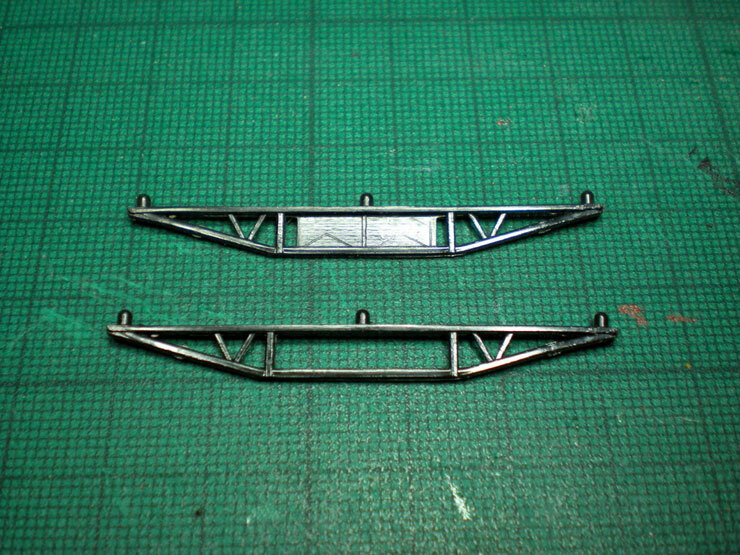 - File or scrape off moulded detail on each end of carriage. Now, this may be the final order of works list, but it took all of the steps below to finalise it. So what you see below here are all the steps listed above, but not necessarily in the correct order. Progress has been slow to start with, mostly due to some fine weather and lots of outside jobs. But there has been a little progress. Cut out the fake battery boxes from the frames. There won't be any battery boxes on this carriage, but for next time, I'll use square balsa wood for some standalone boxes to fit behind the frame. 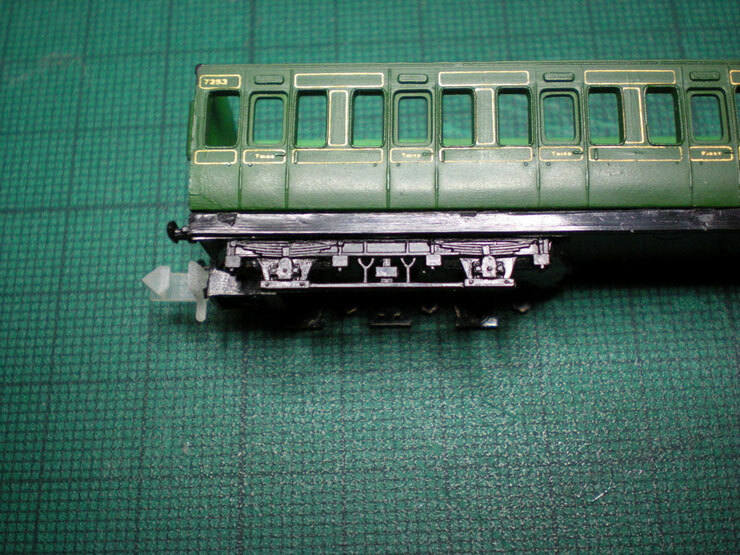 The trick is to hold the rather flexible bogie frame near the middle. 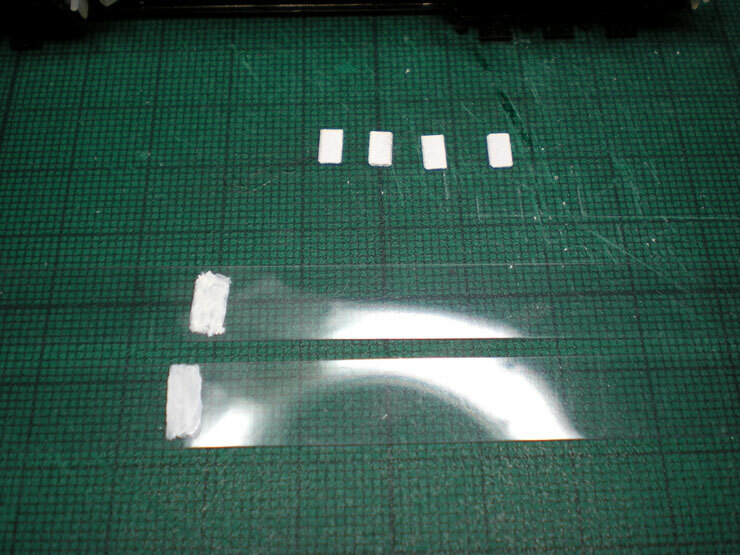 Then gently, and lightly, saw through with a modelling knife. Each bar cuts through in only a few seconds and they come off very easily. Why put in all this work? Mostly because there's nothing compatible available. 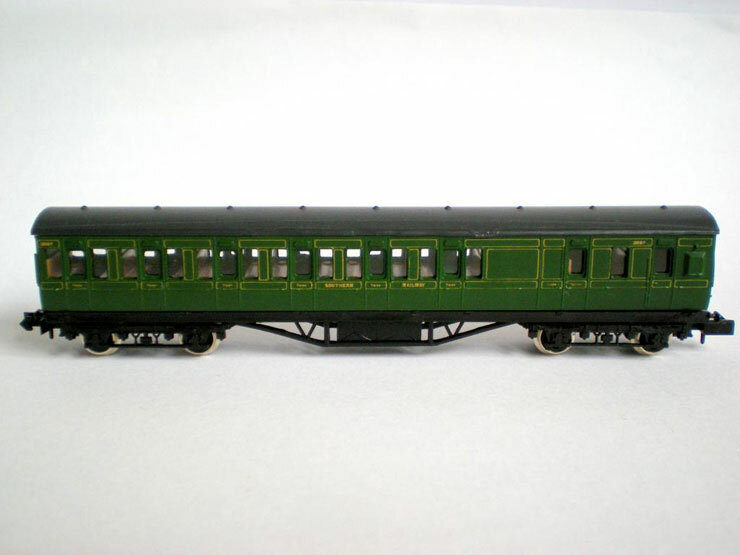 The new Dapol coaches (2015 release) are Maunsell low window stock of 1926 onwards. 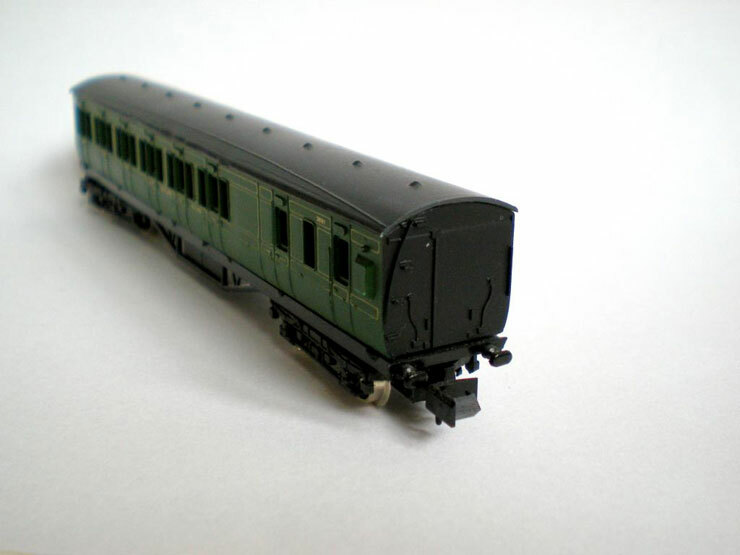 But for anyone modelling the pre-war period they're still pretty new and are used on premier services. Most other services would still have used pre-Grouping and early Grouping stock, which is why it's important to be able to make these old Farish suburbans look better. They remained in service right up until the 1950s, so this work is valid for just about any steam period.